Twic county has suffered the worst excesses of conflict. Located on the border between north and south Sudan, for much of the last 25 years it was at the epicentre of a brutal civil war. Massacres of civilians were frequent, while women and children were abducted for use as slaves. It was against this background that the local relief agency Sudan Production Aid (Supraid) founded the Twic Olympics. This annual sporting festival pits the county's six payams (districts) against each other for sporting glory - but more importantly brings them together in a spirit of peace and friendship. On a dusty, hard mud field cleared from the bush, men and women compete in a range of sports including football, distance running, volleyball and tug o' war. War was still raging when the Twic Olympics began in 2000. It was another five years before the northern government and the southern rebels reached a peace agreement, allowing those displaced by war to return home. However the peace is fragile. As well as organising the games, Supraid uses the opportunity of such a large gathering to conduct education on issues such as HIV prevention, peace building and reconciliation. 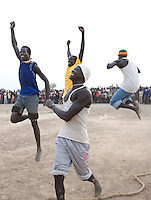 The games offer a chance for people - and youths especially - returning after the war to integrate back into their communities by being part of a sporting team. As one of the participants says, "the Twic Olympics challenges everyone who thinks nothing good can happen in Sudan." Tom Pilston photographed the event for Christian Aid, one of twelve international organisations that fund the games.